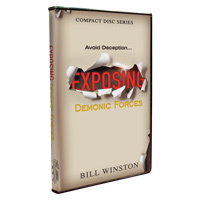 In “Exposing Demonic Forces” Dr. Bill Winston digs deep into God’s Word to show you how to avoid the spiritual traps that try to keep you from your inheritance in Christ. As believers we fight the good fight of faith. There are no limits to what God can do when we believe. Take hold of the revelation shared in this series and boldly go into your promised land. Cut down every spiritual giant trying to hold you back when you know how to skillfully Expose Demonic Forces!